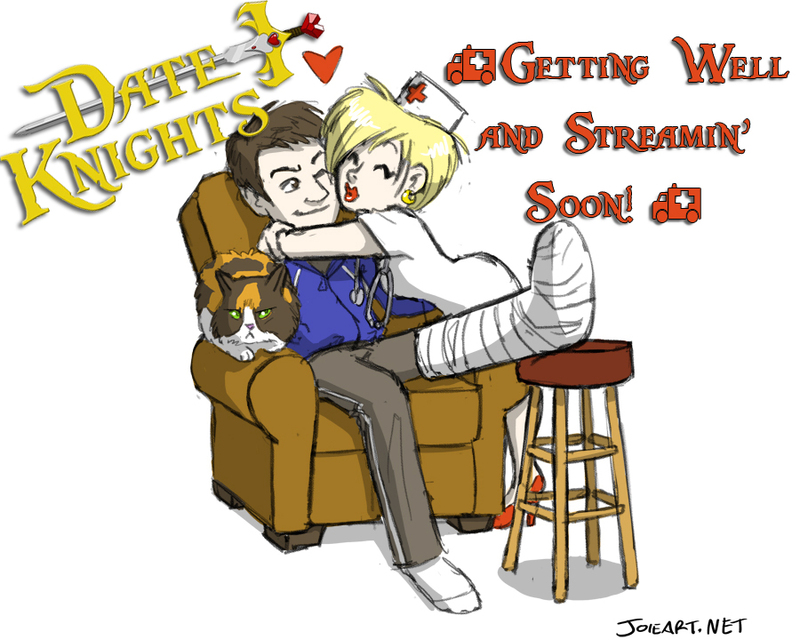 For those of you who don’t know, Nick and I run a Twitch channel called Date Knights, where we film ourselves playing games and talking to people in our chat LIVE, and it’s been entertaining to us and growing strong. For those of you who do know of Date Knights, you’re likely here for the Nick Update. Here it is! About a week ago, Nick was in a car accident. A women made an illegal left turn in front of Nick while he was driving through a green light. He tried to dodge her, but he still ricocheted off her car and into a guard rail. Her car then bounced into a stopped car at a red light. That lady really effed up, because she is legally at fault for the whole thing. Derp. The crash impacted the side of Nick’s right knee, shattering a part of his leg called the Tibal Plateau. 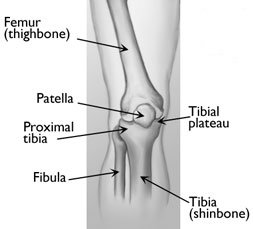 The Tibial Plateau is the upper part of the shin bone. It is one of the most important weight bearing areas of the entire body. Because Nick’s was rekt, he had to have a plate and screws surgically implanted. This ain’t your grandmother’s knee surgery, unless she had a displaced Tibal Plateau fracture. Then that’s exactly what it is. We got to leave the hospital late on Valentine’s Day, and this has been one of the hardest weeks of Nick and my life. Once the meds from the hospital left Nick’s system, it took days to properly manage his pain. He can’t really do anything on his own, so that has been difficult for Nick and exhausting for me. Simple things like getting out of a chair, walking down a hallway, getting dressed, etc, are anything but simple. I literally carried him into the house after an impromptu doctor visit yesterday, because he was in too much pain to hop. Nurse Shawty is strong. She totally lifts, bruh. Eeew! Look at that boo boo! 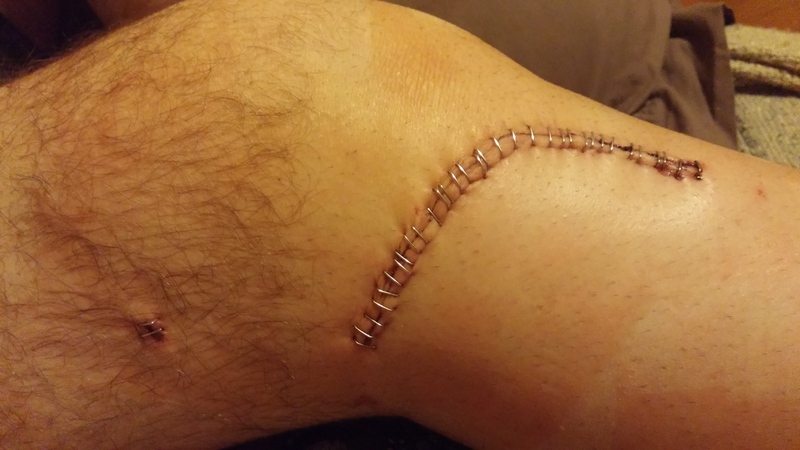 There is one more small incision near his ankle, too. Right now, Nick can’t sit upright. He had to sit in a wheelchair yesterday for that doctor visit, and he was in serious pain. There is no way we could sit in our computer chairs like normal. His leg needs to be elevated and supported, Also, it would not fit under our desk. We have been brainstorming ideas to move the stream to our living room, but that is also a challenge. Our setup would be difficult to move from our study, and building a temporary setup will prove troublesome, especially with additional spacial issues involving our living room arrangement. It’s not out of the question, but there are lots of questions to be answered first. This first week has been physically exhausting and emotionally draining for Nick and me. Nick’s been adjusting to his immobile, more vulnerable lifestyle. He is adapting and struggling simultaneously. It’s hard to go from being young and healthy to immobile and helpless in seconds. Poor thing. Also, I have always been prone to depression, and if I said all the stress from Nick’s pain, my caretaker responsibilities, bits of drama, physical fatigue, and lack of sleep has not triggered some mind-blowing bleakness, I’d be lying through my teeth. Things are starting to look-up a little, and I know with that will come higher, more ambitious spirits, and hopefully after that, the power to bring back Date Knights! We have been amazed with how much you, our followers, care about us. Your concern, kind words, generosity and eagerness to watch us stream again make Nick and me so happy! We never thought on that Halloween night when we started streaming that we would have 700+ followers and new online friends who would care so much about our wellbeing. Thanks so much for your love and support! We will keep our Minecraft server up and running for you guys, and we will keep you posted on Nick’s progress through our social media. And when we stream again, we will Kitty Disco like we’ve never Kitty Discoed before!!! This entry was posted in Uncategorized and tagged car accident, Car Crash, Date Knights, Derp, gaming, Girl Gamer, Kitty Disco, Knee Surgery, Lolcats, Minecraft, Nick Update, Stream, Surgery, Tibial Plateau, Twitch. Bookmark the permalink. Get well soon Nick and the best for both of you!